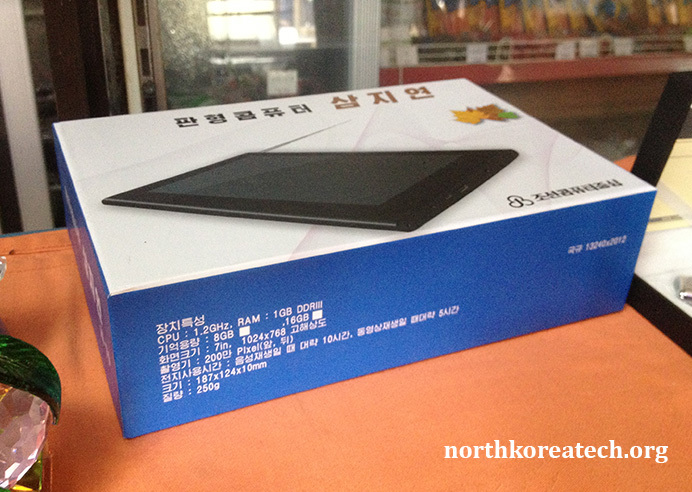 The Samjiyon tablet computer sits in a Pyongyang gift shop. North Korea, like the rest of the world, is getting hooked on tablet computers. In the last year, state media has highlighted three different tablet computers that are now, according to the reports, available in the country. The latest of these, the Samjiyon (??? ), is also on sale to foreigners and one of the tablets was recently purchased by a tech-savvy tourist. The tourist, Michael, doesn’t want to use his surname, but I’ve spoken extensively with him via e-mail, phone and Skype video chat about the tablet and how it performs. The Samjiyon first appeared to the world at the 8th Pyongyang Autumn International Trade Fair in September 2012. Supposedly developed by the Korea Computer Center (??????? ), the tablet is the first from the country to support reception of TV broadcasts. With that, it was purchased. Taking it out of the country proved no problem, he said. 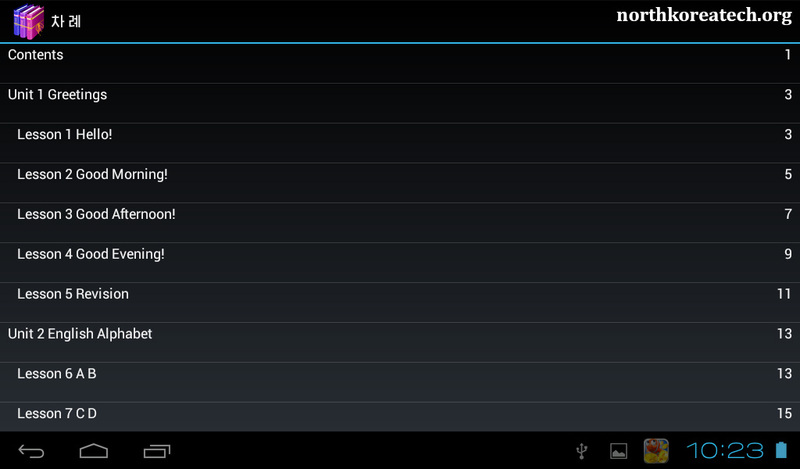 So, how does the tablet stack up against the many Android tablets available in developed markets like the U.S.? Our tech-savvy tourist was well placed to make that distinction because of a job that affords regular access to many high-end Android tablets, like the Galaxy Tab, Galaxy Nexus tabs and Amazon Kindle. If you believe the specs on the Samjiyon’s box, it’s got an 1.2GHz processor (which is more than the Samsung Galaxy Tab 2 7″‘s 1.0GHz processor) and 1GB of RAM (the same as the Samsung). All of the typical Android apps are present on the tablet, but don’t look for any Google software. That’s because the basic version of Android, which is available at no cost to any company that wants to use it, doesn’t include Google apps like Gmail, YouTube and Navigation. To get the Google apps, hardware developers need to sign an agreement with Google. That wasn’t done for the Samjiyon and for good reason: with no Internet access, the Google apps are pretty much useless anyway. North Koreans might not have Internet access, but they do have the ability to connect to a nationwide internal intranet. A web browser in the Samjiyon comes equipped for the task. It’s programmed to default to a home page at a numeric IP address, 10.76.1.11. The address sits within a private address block, specifically designed for use on internal networks and not globally. There are several pre-programmed bookmarks. These are linking to sites on the domestic intranet. In the case of the Rodong and KCNA sites, which also have sites on the global Internet, the URLs are different. However, despite the Web browser, Michael says there doesn’t appear to be any way to connect the WiFi. Some of the settings in the tablet’s configuration files refer to a hardware WiFi adapter, so it appears to have the ability to connect built inside it. It’s possible the configuration entries are erroneous, that WiFi exists in hardware but has been disabled in software, or that it’s hard-coded to work on a certain network and cannot be changed like conventional tablets. Several of the apps on the Samjiyon appear to be domestically made. Perhaps the most interesting of these is a version of Adobe’s PDF reader that’s been repackaged by the Korea Computer Center. It’s not immediately clear what changes if any were made, but the name of the PDF reader software package contains a clear reference to the Korea Computer Center. The names of other foreign-souced software packages haven’t been changed, so it apparently signifies some level of repackaging or modification. There’s a number of games on the Samjiyon, and some are from international developers. Among them, a Korean-language version of Angry Birds Rio. It’s interesting to think that this most addictive of Android games have reached as far as Pyongyang. How it got there is a mystery. Rovio, the Finnish maker of the game, hasn’t responded to several requests for comment. And, if you hadn’t figured it out from Dennis Rodman’s January trip to Pyongyang, Kim Jong Un is a big basketball fan. 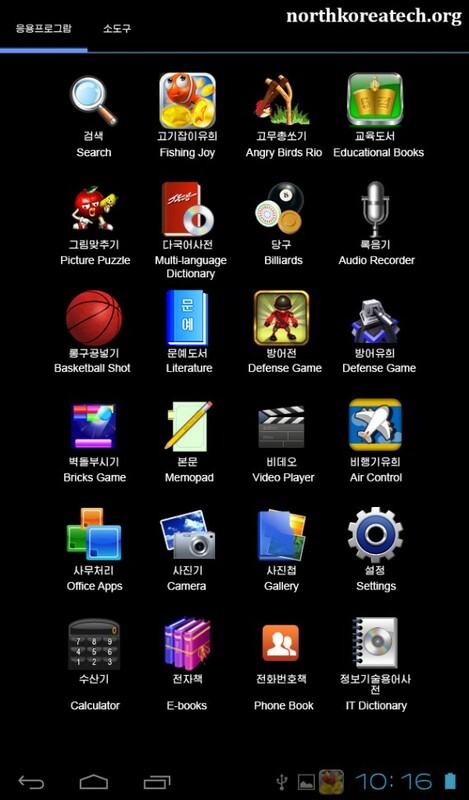 So it’s interesting to see the Basketball Shot game as one of the apps on the Samjiyon. A promotional video for the Samjiyon highlights its usefulness as a tool for students. That’s underlined by the inclusion of several educational and reference software apps. 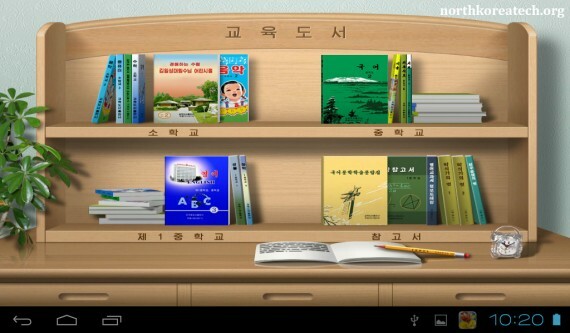 On the left side of the top shelf are elementary school books: music, computers, mathematics and Kim Il Sung’s childhood. On the right side are middle school books covering language and the arts. The bottom shelf has more middle school books on the left concerning English, biology and chemistry. The right side has reference books. Educational apps are graphically displayed in a bookshelf-like arrangement on the Samjiyon. The build number is the date and time when the system software image loaded on the tablet was finalized: March 11, 2013 at 3:46pm. “The device’s form factor leaves some things to be desired, as the power and volume buttons protrude with some rough edges and trying to open the SD card slot is a bit awkward. Perhaps the biggest misstep in the hardware is the TV antenna and the way that one’s fingernails play a critical role in being able to extract it. Reminds me of pulling a stylus out of a Palm Pilot but even more frustrating,” said Michael. The tablet comes with a built-in analog TV tuner. North Korea uses the European PAL color system and the Russian channel system. Hitting the TV button on the display starts the TV function and allows the user to choose between four preset channels: VHF channels 5 and 12 and UHF channels 25 and 31. According to a list of North Korea’s TV transmitters in the most recent edition of the World Radio TV Handbook, channel 5 is used by Mansudae TV in Pyongyang and channel 12 by Korea Central Television. The same book says Pyongyang’s other TV station, Ryongnamsan TV (former Korea Educational TV), uses channel 9 and lists no UHF channels at all for any North Korean TV outlet. Given the difficulty in getting accurate information from North Korea, it could be that the list is based on old information or incorrect. It could also be the case that UHF broadcasting is now in use in Pyongyang. Manual tuning isn’t possible. This is inline with North Korea’s policy of fixed tuners on radios and TVs so people cannot listen to foreign broadcasts, but also means the TV function is of little use outside of Pyongyang because KCTV uses other channels in different parts of the country. Perhaps that’s no so much of a problem given the $200 price tag and the lower incomes in the provinces. 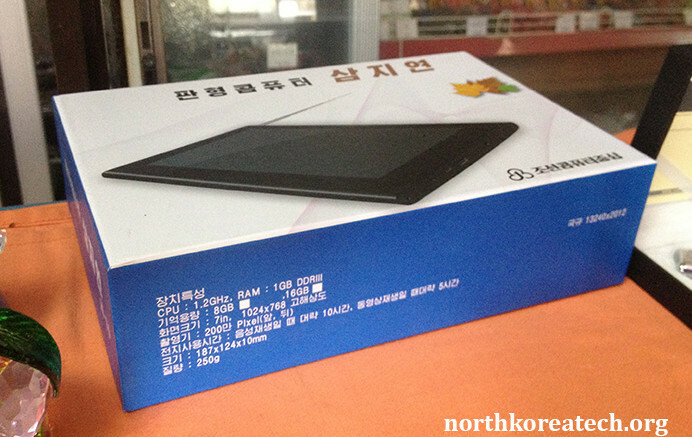 5 Comments on "Review: Samjiyon tablet"
Samjiyon use Dual core mediaTek? 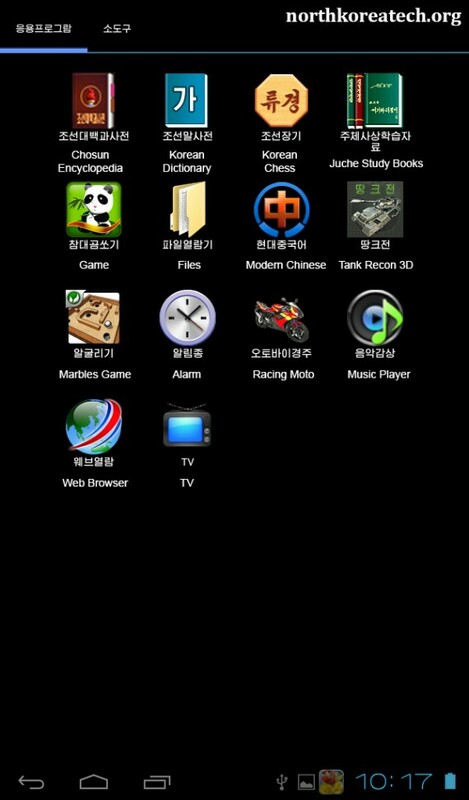 Is there a way we could get hold of the apk files for the very DPRK apps? Encyclopedia, dictionaries, chess, tank games, and the certainly very exciting Juche Study Books 😉 I suspect given the licence used by the manufacturer that it could be piracy, but is there even a licence? The issue with the headphone jack is almost certainly that it’s a Chinese one not the usual one we find in the west. The Chinese variant is a couple of mm longer. You get the same issue with Chinese imported mobile phones. It’s just seems funny that Korean products are made in China as well. I had no clue that they are not provided Internet services either. Código Espagueti » Lecciones de un dictador: ¿qué libros están permitidos en la iPad norcoreana?